High quality clean bulk materials are used in many industries including plastics, food, minerals, and pharmaceuticals. High quality standards in these industries require ensuring clean bulk raw materials that are free of dust, streamers, and other fine contaminants. A table-top testing device is now available to analyze fine particulate content of bulk material flows with laboratory precision. 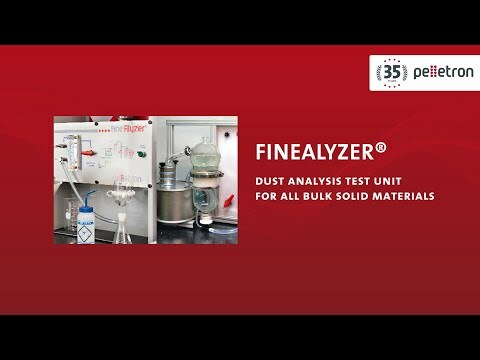 Pelletron’s FinAlyzer is a completely self-contained table-top device that will tell you the fine particulate content of your bulk dry material with laboratory precision. Performing the ‘Wet Test’ (ASTM Standard D7486-08) the FineAlyzer rinses the bulk material with pure water and filters the effluent through a 1.6 micron filter disk. The disk is dried and weighed giving the amount of fine particulates that were washed out of the bulk material sample. Comparing this to the initial sample weight gives a ratio of fine particle contaminants to bulk material often referred in terms of PPM.